Peninsula Automotive hosted the 10th Annual Car Show on Sunday, September 12, 2010. It was a day of fun and excitement for the whole family. The highlight of the show was the ever-popular Engine Blow! This year the engine ran for over five minutes before blowing up, bringing cheers and applause from the crowd of spectators. One of the best things about the Annual Car Show is that there is always something for participants to do. They can wander the swaps , see what sales are going on inside the store; they can participate in the trivia board, on which 50 different VW parts are placed for people to guess what each one is, decorate an Oval Window Beetle with chalk that had been covered in chalkboard paint, join in the valve cover racing, cast their votes for the People’s Choice award, or enjoy the delicious BBQ! Enjoy our gallery of images below and click on any image to see it full size! This year’s Car Show had a record-setting 65 cars pre-registered for the car show and easily another couple dozen parked outside! Below are this year’s show results. Click on each winner to see a picture of his or her car. We want to thank everyone who came out, participated, and made this the best Car Show yet! We would also like to take the opportunity to give a huge thank you to all the people and companies who contributed toward making The 10th Annual Car Show such a success. From raffle prizes to display cars to our excellent DJ, everyone came together to really set a new standard for VW shows in the South Bay! Last, but not least, we want to give a great deal of thanks to everyone who helped volunteer with the creation, promotion, and running of the show. 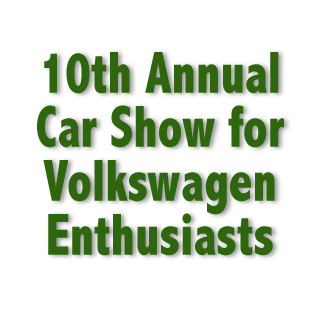 Without your help, the 10th Annual Car Show would never have happened! We would also like to give a huge thank you to Jim Kikuchi who captured our Engine Blow and posted it for everyone to enjoy!